Last week I let you in our secret. After that post, things finally became official and we actually closed on our house last Friday….a week and a half later than expected. The delay did more than stress us out. It shortened our timeline. Our moving help is coming this Sunday so we have to get everything painted, cleaned, and ready for the move. Quite a while ago, J took the first part of this week off so we would have some days off together. That worked out perfect for us because now we have three full days to try and get everything done. Before cracking the whip this morning, J asked if I was in the mood for breakfast. I figured it may be the only good meal I eat today, so I said yes. Good thing because she already had the place picked out. 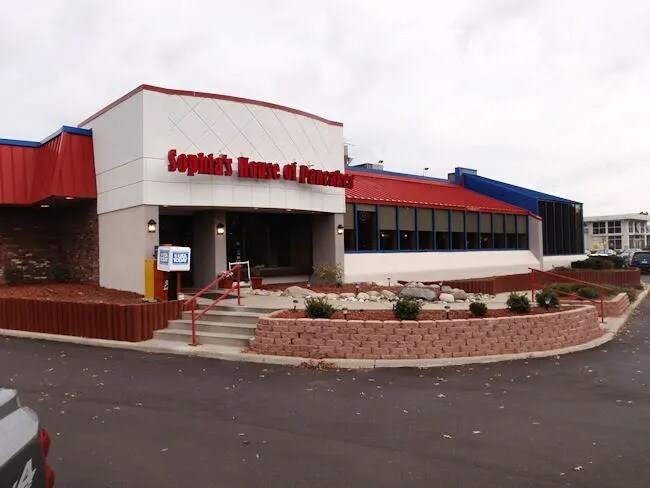 Sophia’s House of Pancakes moved in to the old Big Boy location on Stadium Drive near Drake. There are a few differences in both the facade and the decor, but it’s not hard to tell what the place used to be. This is actually the eigth Sophia’s location with the original being in Benton Harbor. We’ve never eaten at that one, but we did do breakfast at the Grand Ledge location (also in an old Big Boy) before we moved to Kalamazoo. We were pretty surprised to see the restaurant so full on a Monday morning when it was probably closer to lunch time than breakfast, but the parking lot was crammed. Once we found parking, we headed inside to find the typical Big Boy set up. A host, who I believe is the owner, took us to a booth in the first dining room. He dropped off a couple menus and pointed out that breakfast is served all day. We started with Pepsi’s as we looked over the enormous menu. 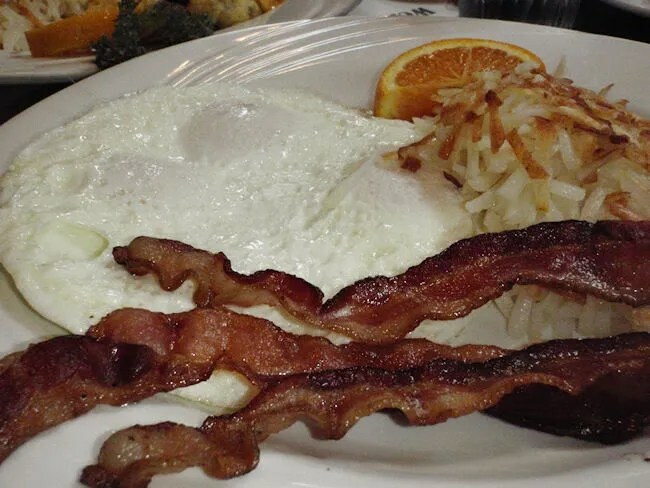 Even the breakfast side has more than just the typical options. I don’t usually have a hard time deciding at breakfast, but I sort of did today. I stuck with simple food and ordered Two Eggs over medium with bacon, hash browns, and pancakes. I should have went a little harder on the eggs, but that was my fault, not the cooks. They were actually done perfectly medium, but I was in the mood for hard since I didn’t have any toast to soak up that yolky goodness. The three strips of bacon were really crispy, but not burnt. The pancakes were delicious and you’d expect them to be when they are the restaurants namesake. There was an article in the Gazette today about the place and the reviewer made a big deal about Sophia’s serving imitation syrup instead of real maple syrup. I can appreciate the complaint, but it’s really not a big deal to me. I’ve never really had real maple syrup as luxuries like that weren’t important enough to break my family’s budget. We always had the Mrs. Butterworth, so that’s what I’m used to. The funny thing is the waitress almost forgot it. She remembered without me having to say anything and brought a little cup of syrup and packets of whipped butter. J ordered one of the items that caught my eye. She got the Bacon Scramble which is basically scrambled eggs, but with bacon and cheese mixed it. The scramble is made with three scrambled eggs and it is a lot more put together than typical restaurant scrambled eggs which makes me thing they use real eggs? J called it a casserole which is a pretty accurate description. Her breakfast came with hash browns and she chose to go with toast. Our bill was a little under $20 and neither of us left hungry. Neither of us were able to clean our plates. 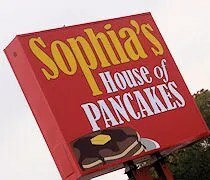 Sophia’s House of Pancakes has a reputation of being one the best breakfast joint in the St. Joe/Benton Harbor area. 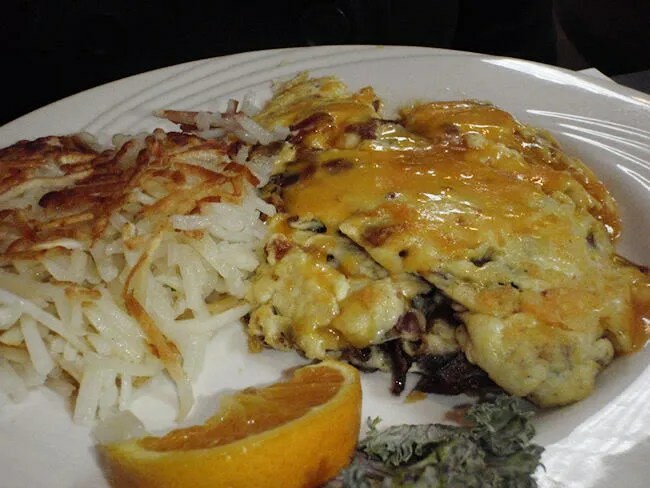 When we lived in Lansing, we had several people tell us to make the drive to Grand Ledge to visit that location and so far, there seems to be a lot of hype around the Kalamazoo spot. Our breakfast was really good and as we stood in line to pay, the man who I believe is the owner came up and shook our hands thanking us for stopping by. All I ask for from a syrup is that it not contain HFCS, which could be a concern if they’re buying bulk restaurant supplies from Gordon. So glad Log Cabin stepped up last year and went back to using real sugar. That doesn’t even totally bother me, but again, I understand how it can some people. There’s HFCS is almost everything….hell, it’s in the Pepsi I’m drinking right now, so it’s not a deal breaker for me. Again, I grew up eating the cheap crap, so that’s what I’m used to. You know when you get scrambled eggs at a lot of restaurants they’re just little chunks of yellow globs that don’t really resemble eggs? The Scramble at Sophia’s is a lot tighter and it holds together.